In case you missed it, ISTE 2016 took place earlier this week. During the event, educators prepared themselves and their schools for the future of education. 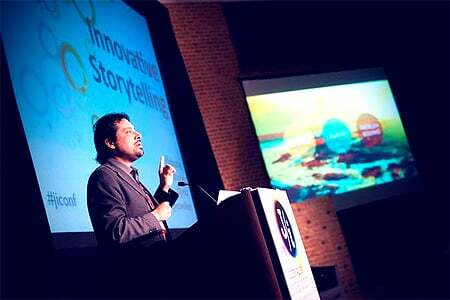 To highlight some of the insights gained from the conference, we’ve put together a recap. The recurring themes at ISTE 2016 were messages of collaboration, empowerment and engagement. Everyone is looking for tools and technology that help to facilitate a collaborative environment; in the classroom, at a local school level, all the way up to the district. The most disruptive technologies will be the ones that can impact the entire structure of the school system, not just in the individual classrooms. To make that happen, it requires the collaboration and participation of everyone involved. As Brad Currie, co-founder of #satchat, said during his session, “Students take risks when teachers take risks. Teachers take risks when school leaders take risks”. In order to facilitate a true collaborative effort, teachers and students must be given the right tools, training and support to succeed. Organizations are focusing more on simple, yet impactful technologies that can be easily accessed and understood by end users. Though a blessing, technology is also a curse when it comes to keeping students engaged. Schools are looking to implement technologies that are going to help students remain engaged, instead of distracted. “Digital citizenship” is a huge buzzword that teachers are getting excited about, and it means that teachers, leaders and parents should be showing students how to use technology appropriately and responsibly. Though not mentioned in the above takeaways, it is still worth noting that educators are becoming increasingly concerned with privacy. All too often the DIY method of edtech leaves a huge gap where privacy is concerned. In a study by Fordham, they found that “less than 7 percent of the district-vendor contracts restricted the sale of student information by vendors”, which is a bit scary. We can’t wait for next year, see you then! We're back, y'all! 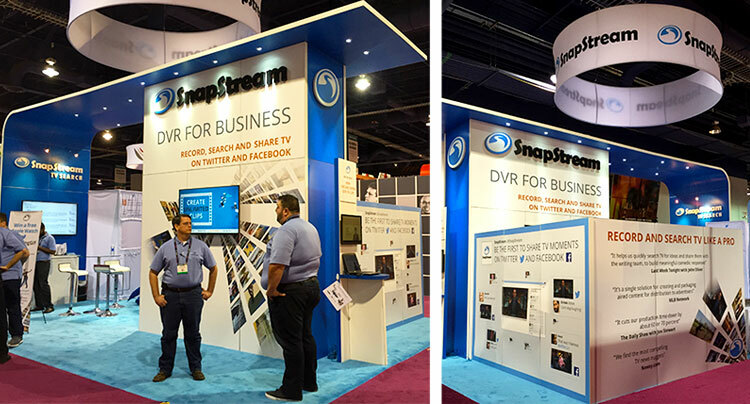 Team SnapStream just wrapped from exhibiting at the National Association of Broadcasters (NAB) Show in Las Vegas. Our booth was awesome this year! We got to meet with hundreds of folks in the television and entertainment space, plus government and education, too. Everyone was digging our new social TV features for sharing TV moments to Twitter and Facebook. We had some beta features on display, exclusively for the NAB crowd, including time-coded tags and the new transcript word cloud. But the best part, hands down, was showing new people what SnapStream can do and watching their eyes light up! When you demonstrate how easy it is to schedule recordings in our program guide, search by keyword and pull up a clip, people are amazed. Our established workflow solves a very real problem for organizations out there, who are still using DVRs or don't have an existing or easy way to manage television. We're excited to help more people overcome their TV recording challenges, and provide all the right tools for efficiently tracking and monitoring TV. 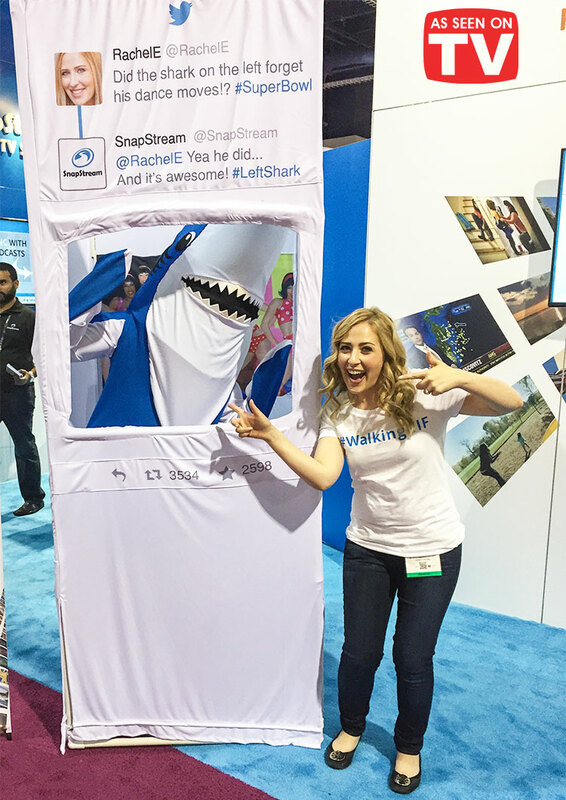 As soon as you walked up to SnapStream's booth, you were immediately greeted by a smiling and waving shark. 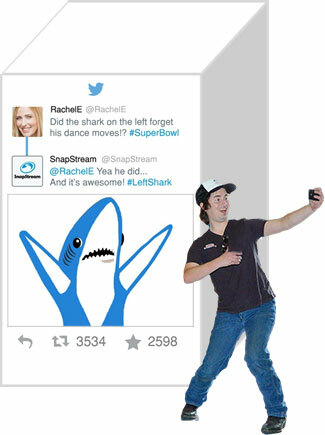 The one and only #LeftShark, as seen on TV... and Twitter! Many people hadn't seen a real, live GIF in person before. Let alone, a GIF that walks and talks! The #WalkingGIF made waves around the Las Vegas Convention Center, and made friends with everyone he met. Check out our blog post about the #WalkingGIF contest to see some of the wacky photos and to find out who won! 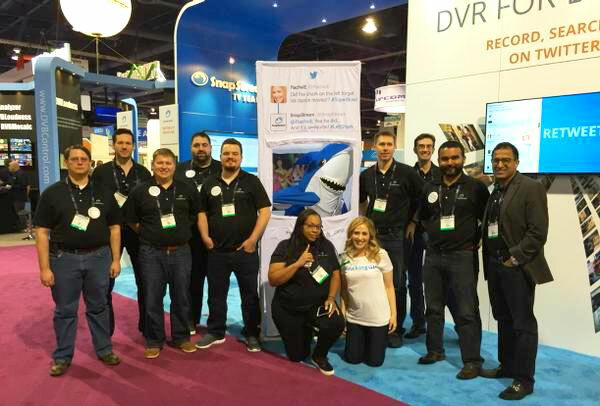 All in all, our 9th NAB Show was a huge success. We were inspired to meet new people we can help, and there's nothing we love more than continuing relationships with our amazing customers. See you next year for our 10th anniversary! We are on Cloud 9, literally! It's our 9th year in a row exhibiting at the National Association of Broadcasters (NAB) Show in Las Vegas. And we are thrilled to be introducing SnapStream Cloud, along with SnapStream's new social TV features, to over 100,000 of the most tech-savvy media and entertainment professionals. If you're one of 'em, come on by and visit! We're in a prime-time spot (pun intended) in South Upper Hall SU5402. We are the 9th booth (noticing a theme here?) in the first main aisle. Here's a lovely map for you. Our Walking GIF will be roaming the Las Vegas Convention Center and he needs your help commemorating his inaugural visit to NAB. The contest starts bright and early Monday at 10 AM and ends Wednesday at 3 PM (Pacific Time). Here's how it works! Take a selfie or quick video for Twitter. GIF if you know how! You must use both hashtags to enter the contest. The person with the most combined Retweets and Favorites will be awarded the Apple Watch Sport, so it pays to be creative! Contest runs Mon. April 13th @ 10 AM - Wed. April 15th @ 3 PM Pacific. Must Tweet either a picture, GIF or video with the Walking GIF. Must use BOTH hashtags WalkingGIF and #NABShow to be eligible for the contest. The Tweet with the most combined Retweets and Favorites on Wed @ 3 PM will be declared the winner. In the event of a tie, the person who posted first will be the chosen winner. SnapStream will direct message the winner on Twitter on Wednesday after the 3 PM deadline. The winner will receive the new Apple Watch Sport (color and size chosen by the winner). SnapStream will purchase the watch on behalf of the winner on April 24th, the Apple Watch launch day, and it will be shipped directly to them. Title: CBS Black Rock: Recording & Clipping TV with a "DVR on Steroids"
Come by for a demo at booth #755! CBS Black Rock: Recording & Clipping TV with a "DVR on Steroids"
Hear from CBS Black Rock Media’s Director, Heather Doyle, and Technical Director, David Hadley, as they discuss the TV recording and clipping workflows of their group in a panel led by Gayan Gunawardana of SnapStream. 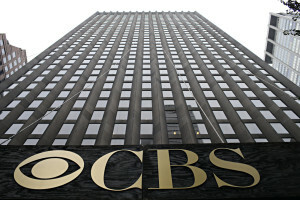 As part of CBS Operations & Engineering, CBS Black Rock Media fulfills TV clip requests for every division of CBS, such as the sales, marketing, sports and affiliate relations groups. Whether it’s a TV clip of the "The Big Bang Theory" for a press rep or an NFL broadcast clip for a sponsor, they can efficiently service everyone with the robust recording and clipping capabilities of SnapStream. Heather and David will briefly review the archaic processes of pre-2008, which were dependent on one-channel DVRs, long overtime hours of manual recordings, hunting for specific clips, editing software and VHS tapes/DVDs. The discussion will focus on how the group was able to streamline processes to a single system and find several “bonus use cases” involving their top exec’s TV appearances and engaging CBS Sports fans on Twitter. 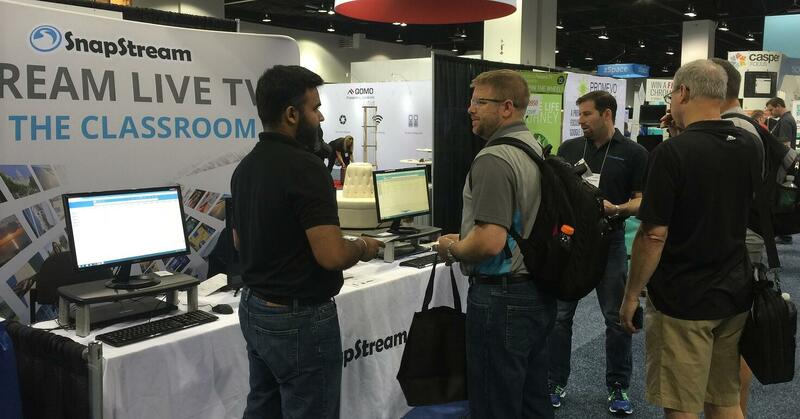 Team SnapStream had a great time at the NAB Show (National Association of Broadcasters). Who doesn't love spending a week in Las Vegas? We visited with a ton of interesting broadcast folks at our booth and knocked their socks off with our TV search technology. Erika Blackwell, a reporter at Your Biz Live TV, was one of our favorite visitors. She interviewed Aaron Thompson (El Presidente) asking how "The Daily Show with Jon Stewart" and "The Colbert Report" have automated their workflows with our product. Watch below to find out the answer and to see what you missed at NAB. You'll feel like you were there with us! On April 7-10, we're off to Las Vegas to showcase the new, upcoming features of SnapStream's automated TV monitoring and content repurposing technology at NAB (National Association of Broadcasters). This year, you can find us (exhibiting for our eighth time!) in South Upper Hall SU4321 at the Las Vegas Convention Center. At the beginning of this year, we released new SnapStream ASI, which ingests and records the ASI stream. At NAB 2014, you can look forward to another new input source: IP Capture! 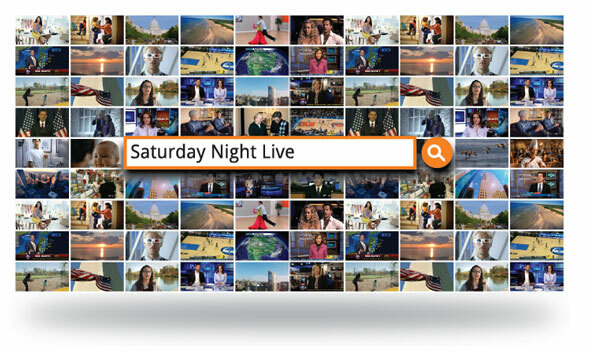 We recently made TV search even smarter with linguistic intelligence. In addition to exact keyword matches, SnapStream analyzes and includes relevant synonyms, misspelled words, pronouns, suffixes and more to broaden the scope of interesting search results. 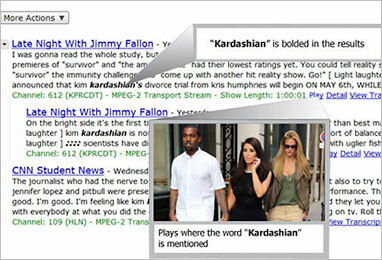 New custom media tags also tie into TV search, because they help you save and search on additional meta data. Earlier this year, we introduced a new option to Clip from Transcript, which saves a video clip based on your selected transcript text. 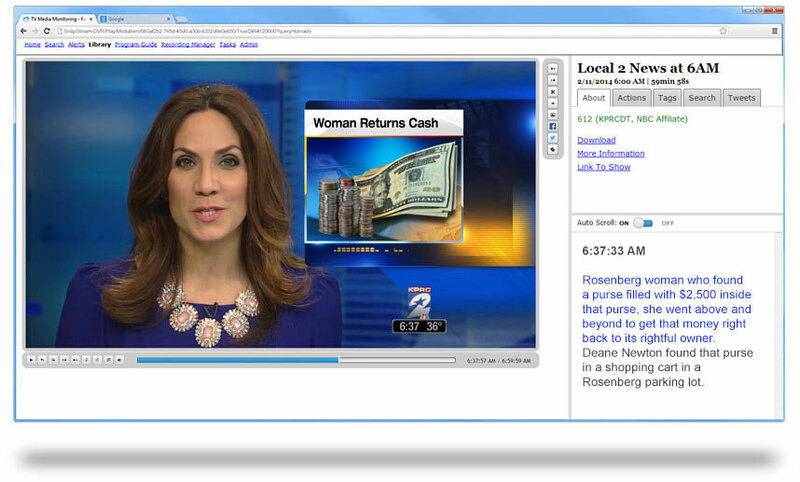 At NAB 2014, you can look forward to the unveiling of new, intelligent Auto-Clipping, which auto-magically clips content based on your TV Alerts. 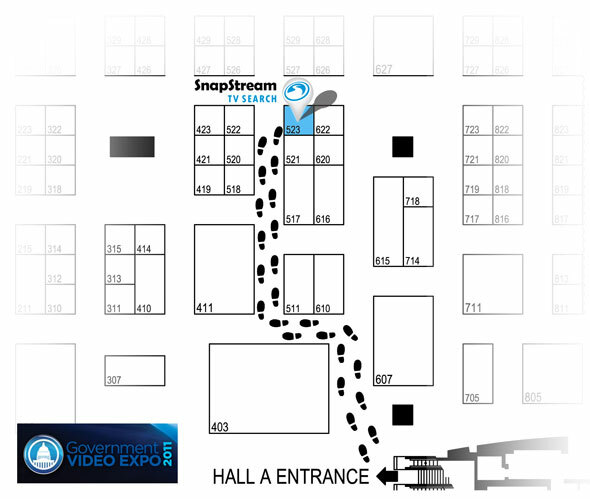 At NAB 2014, SnapStream will demonstrate the singular clip-and-share process, which seamlessly shares clips to SnapStream's Cloud, to be viewed by anyone, on any device, from anywhere. Another new add-on to Cloud Sharing is the ability to grab and send clips more efficiently with batch sharing. 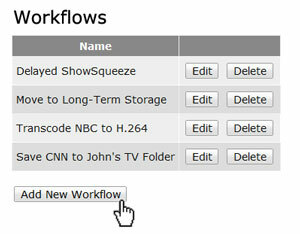 We have made new additions to Workflows, many of them brand new at NAB 2014, such as auto-sharing clips according to your set criteria and exporting content to Amazon S3 (cloud-based storage). 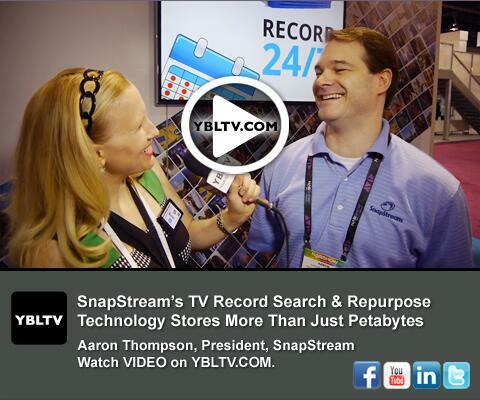 At NAB 2014, we're introducing new SnapStream hardware that speeds up transcoding for faster, more efficient file-based workflows and repurposing. Are you going to NAB? Come swing by our booth anytime for a demo of SnapStream's current and upcoming features. Or better yet, reserve a meeting time all to yourself! Next week, we're heading to the Big Apple to showcase our TV monitoring technology at Content and Communications World (CCW). Many broadcast folks refer to this hallmark event as the NAB of the East Coast. Since NAB in April, SnapStream's engineers have been diligently working to launch SnapStream 6.0 and tons of new capabilities. Whether you're a current user or considering SnapStream for the first time, you'll find that everything in the new version helps to enrich your production workflow for recording, searching, clipping and repurposing TV content. What's new to see at CCW? Collaborate using SnapStream's iPad app during your production meetings. Use AirPlay to display TV recordings and clips from your library in H.264. You can also run searches, create clips and share them in the cloud. Enjoy all of these features on the go, with the mobility and convenience of the iPad. SnapStream's new multi-viewer enables you to watch up to four content streams simultaneously for a multitude of workflow applications, such as comparing what's airing on your competitors' channels at the same time. Monitor the broadcast video and televised transcript in a new interactive way, using Snapstream's new auto-scrolling transcript. Click on any keyword in the text to jump to it. Skip from one keyword mention to the next. Resize the windows to switch your focus from reading to watching, or keep it right at 50/50. Enjoy the ability to track live, real-time events and freely flip between channels without recording anything to disk. 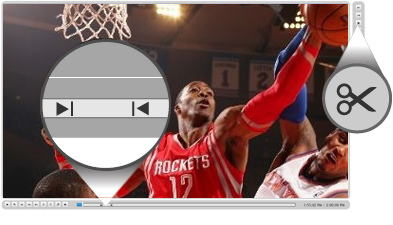 Use the new fullscreen option to expand the video display for presentations or just to get a closer look. Want to schedule a meeting? CCW takes places at the Javits Convention Center in New York City, Nov. 13 and 14. 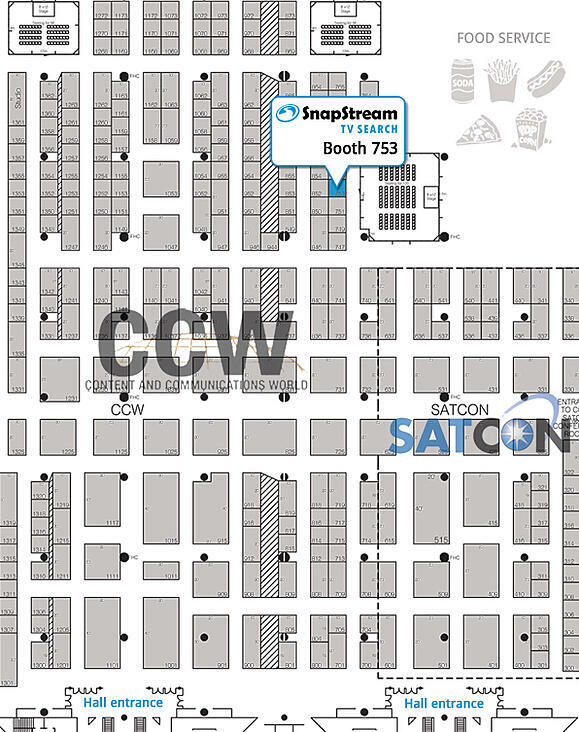 SnapStream will be at booth 753 (see map below). We recommend setting an appointment with us in advance: schedule a meeting here. But, you are also welcome to swing by anytime during the show hours. See you there! Because TV is our world, we are very excited to exhibit at Content and Communications World, November 14 - 15, at booth #856. 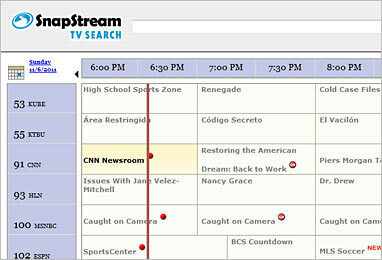 SnapStream enables TV show creatives to easily search TV and incorporate TV clips into their programs. Shows like The Soup, The Daily Show with Jon Stewart and The Colbert Report all tap into SnapStream's endless supply of up-to-the-minute pop culture and news clips. This is the time we live in: the "clip culture." Video clips are suddenly everywhere. They have jumped from the Internet and splattered all over TV. Talk shows, entertainment/comedy shows and even hard-hitting news programs have all added TV clips into the mix of writing and production. SnapStream provides broadcasters with the TV recording and search technology to reliably capture and re-purpose TV content. You have The View re-broadcasting and commenting about what was said on Fox News; CNN reporting on a skit from Saturday Night Live; and E! News recapping Jersey Shore and all the latest episodes of reality TV. Because of how easy it is to create a TV clip and play out to SDI, all of these shows have embraced the clip culture. And we have to admit, we think it's pretty cool how the landscape of TV is changing before our eyes. Five dollar footlongs, five golden rings and five years of Government Video Expo. Five is indeed a prime number. 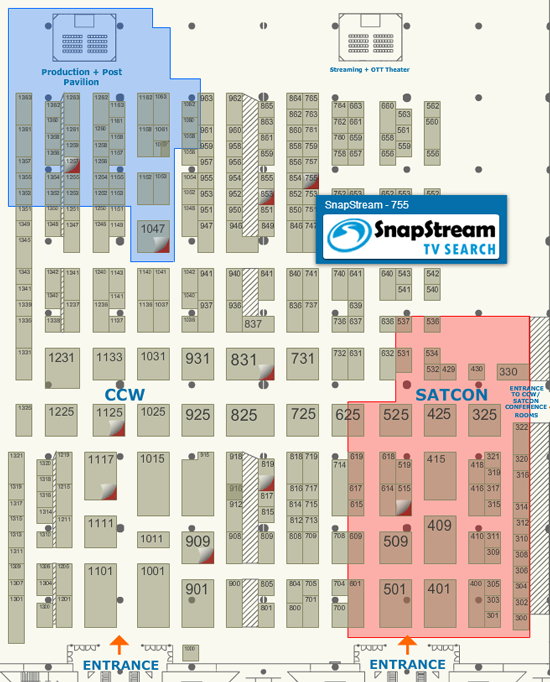 SnapStream is entering its fifth season of showcasing its TV search technology at GV Expo, the East Coast's largest pro video and broadcast expo. Will you be there? If so, be sure to come and find us! This year, we're smack dab in the middle of all the techie action at booth #523. Exhibits run November 30 and December 1 at the Walter E. Washington Convention Center in none other than Washington, D.C. In the context of federal government, SnapStream fits the bill for a variety of purposes, like TV monitoring intelligence and political campaign tracking. At the local level, public information officers leverage SnapStream's TV search and clipping technology to chronicle their media content. In turn, SnapStream supplies a huge workflow boost, expediting media responsiveness while eliminating the chore of manually scanning recorded broadcasts. Get in touch if you'd like to schedule a demo with us during GV Expo.